Get ready for a culinary adventure! Welcome back to the Cooking Academy! After winning a million dollars and starting your own restaurant, you are now writing your very own cookbook. And who better to help your research than your old professor Henri Formage and his friends. 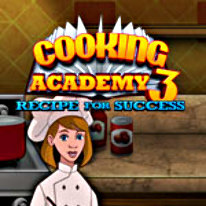 Learn interesting trivia about food while mastering all new skills and mini-games including Refrigerate, Seasoning, Find Food, and much more. Cook Croissants, Tapioca Pudding, Chicken & Waffles, and many more new exciting recipes. Get ready for a culinary adventure!